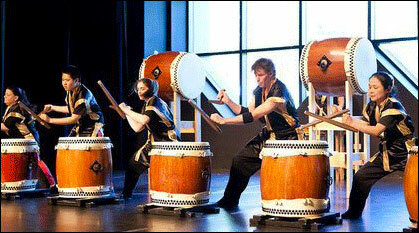 Ga-Ryu is a percussion and performance group from Hiroshima, Japan, founded in June of 2005. Ga-Ryu fuses ‘Wadaiko’ – traditional Japanese drums – with contemporary Western drums, to create a new style of music that moves beyond conventional genres. Their motto is “the pursuit of original expression.” The characters for Ga-Ryu read as “self” and “dragon.” Like a dragon trying to fly to the heavens, the members of Ga-Ryu work constantly to realize their own style of music. 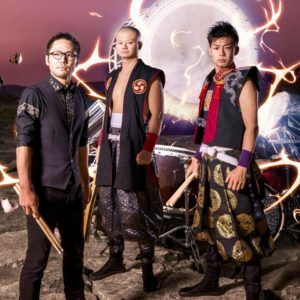 The members of Ga-Ryu challenge themselves to bring together the best of both styles of Japanese & Western drums and present modern music with a strong beat and a sharp edge. 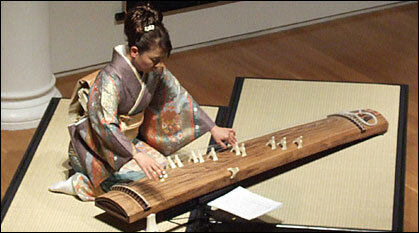 Masayo Ishigure began playing the koto and shamisen at the age of five in Gifu, Japan. After initial studies with Tadao and Kazue Sawai she became a special research student in 1986 at the Sawai Koto Academy of Music. The aim of the academy was to shed new light on koto music by incorporating everything from Bach to jazz and thus change the koto from being thought of only as a traditional Japanese instrument into an instrument of universal expressiveness. Masayo Ishigure has played with symphony orchestras around the world and was featured on the soundtrack to the movie “Memoirs of a Geisha” where she performed with Yo-Yo Ma and Itzhak Perlman. Daniel was awarded the title of “Jun-Shihan” (Master) in the Kinko-Ryu style of Shakuhachi in 1998 under the mentorship of Ronnie Nyogetsu Seldin and Yoshio Kurahashi. His performance name of “Nyohaku” was awarded to him by his teachers and means “the essence of purity” and reflects the spiritual nature of Shakuhachi performance. 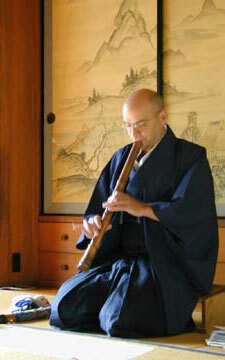 He will be performing throughout the day in the “Chapel” – Bamboo Atrium; a truly unique sound and experience with the rustle of the Bamboo as a backdrop and in the new Zen Rock Garden located at the west end of the Wang Center’s lower lobby. Ichifujikai Traditional Dance Co. is beginning their 6th decade of presenting classical and traditional Japanese dances. Their repertoire represents the elegant Soke Fujima Style. 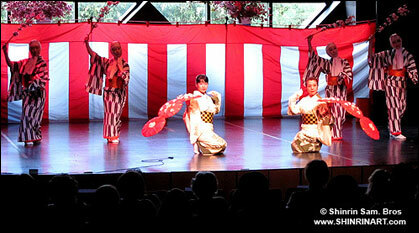 Yosakoi Dance Project combines traditional Japanese movements with modern music in this highly-energized form of dance. They have been performing for over 10 years, spreading knowledge about the Yosakoi style of dance through performances and workshops. Cherry Blossom is one of their busiest seasons! Long Island’s own Ryu Shu Taiko will present traditional & contemporary pieces adapted from & inspired by the rich folk traditions of Japan.